The Knitting Pirate » In Which the Pirate Continues to Stripe. « In Which the Pirate Crosses Her Fingers. In Which the Pirate Continues to Stripe. The Stripey Striped Scarf is coming right along. I'm almost at the end of the first two balls of yarn, and I'm noticing that the 1x1 ribbing takes up a lot more yarn that I thought it would, and uh... I may need to pick up another two balls of yarn. I'm going to wait until the first two balls are really finished, and measure, and imagine another few inches for blocking. But I really like long scarves, 6' at least, and this just isn't going to make it. No way. On the other hand, I like how the colors look a lot better now. So what if there's a bit of green and red and bright yellow next to each other? So what, purple and orange vibrate together? There's a good bit of pleasant purple on purple and green on purple and light green on dark green. And and and. 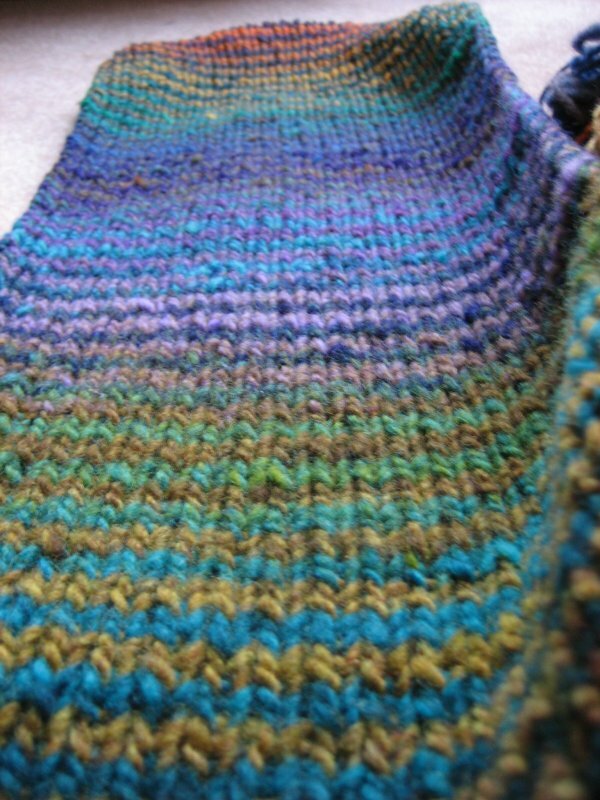 I love color; it's one of my main reasons for knitting. Not to mention the textures. And, oh yeah, the functional useful product. And, oh yeah, it's fun, too. Anyway, I think I might stop at the yarn store this coming weekend and just check what colors of Kureyon they have in stock. You know, just to check. Can't have a short scarf, now can I? 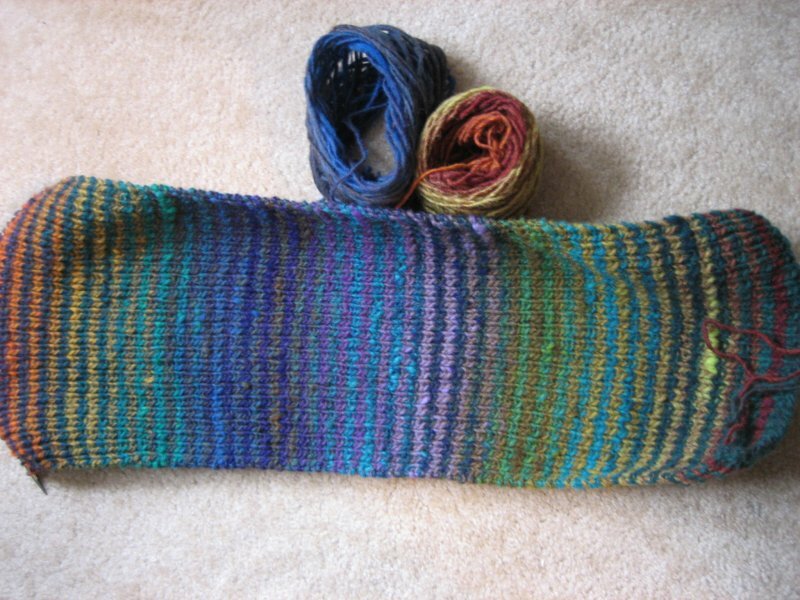 This entry was posted on Tuesday, June 19th, 2007 at 16:37 and is filed under scarf, stripey striped scarf. You can follow any responses to this entry through the RSS 2.0 feed. Both comments and pings are currently closed. I love how the colors are working up together! Very much a rainbow. Reminds me of the pillows I have on the couch.